The Model 905P is a process O2 analyzer, designed to check oxygen levels in all types of processes, gas blending, biotech, fermentation, fruit storage areas, welding gases, and controlled atmosphere rooms.If you require 0-1000ppm analysis, please see our ZR1000. This process o2 analyzer is available with any single range from 0 to 5% up to 0 to 100% O2 vol/vol full scale. 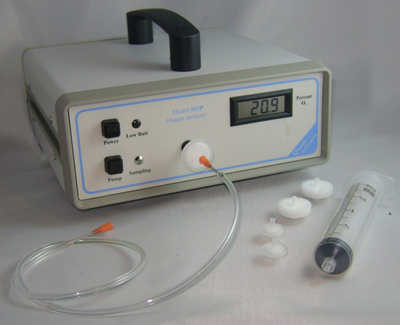 For those applications where a source of sample flow is not available, the 905P can be equipped with an optional sample pump which can operate in a continuous or batch (1-10 seconds) mode. The Model 905P design incorporates a long-life, heavy duty, proprietary electrochemical, maintenance free sensor. The sensor is totally sealed, operates at room temperature and is internally compensated for slight temperature variations. Unlike other sensors, it is not dependent on a controlled flow rate for accuracy, is not heated and is not affected by high levels of CO2, hydrocarbon or other gases. The sensor assembly is cable connected to the control circuit board. It can be used with diffusion or pumped sample draw systems. The measurement accuracy is not affected by sample flow rate. The expected electrochemical sensor life is typically 5 years, unlike other analyzers with an electrochemical sensor that last 1-2 years. Calibration: Calibrates with room air; span and zero adjusters on back of analyzer, NIST certificate included. Options: Internal pump, cycling-enabled pump, 0-5Vdc analog output, internal relay/control board to activate external audible alarm, buzzer, or contact closure.